, a learned dissenting divine, was born in 1693, and received his academical learning under his uncle, the rev. 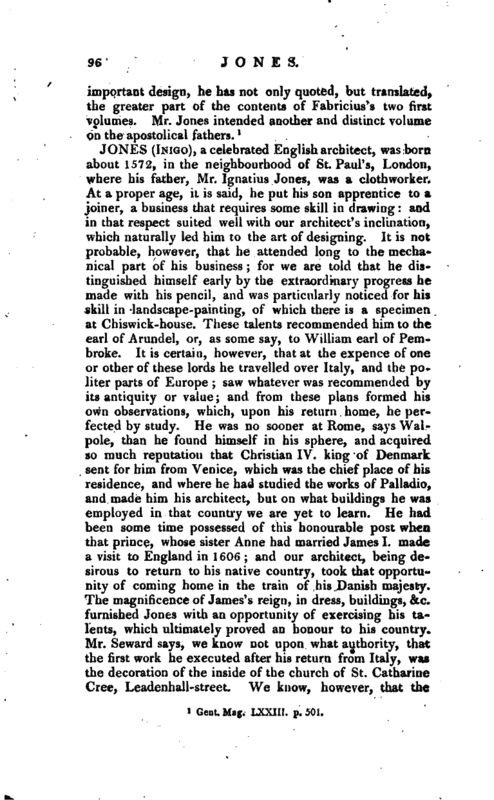 Samuel Jones, first of Gloucester, then of Tewksbury, the tutor of Chandler, Butler, and Seeker. He was fellow-student with the latter in 1711, and was a distinguished scholar, when he entered upon academical studies. It is apprehended, that he was a native of the North of England, and that his father was a gentleman in affluent circumstances. There was with him, at the above seminary, a younger brother, a youth of quick parts, who afterwards settled as a dissenting minister at Manchester. 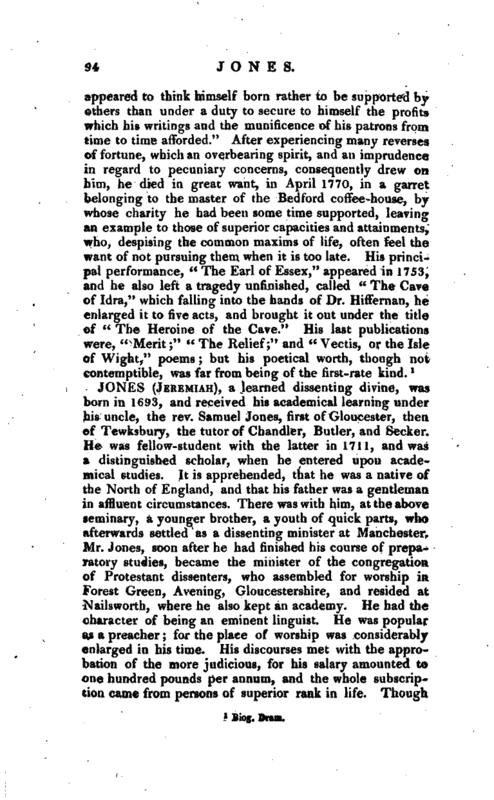 Mr. Jones, soon after he had finished his course of preparatory studies, became the minister of the congregation of Protestant dissenters, who assembled for worship in Forest Green, Avening, Gloucestershire, and resided at Nailsworth, where he also kept an academy. He had the character of being an eminent linguist. He was popular as a preacher; for the place of worship was considerably enlarged in his time. His discourses met with the approbation of the more judicious, for his salary amounted to one hundred pounds per annum, and the whole subscription came from persons of superior rank in life. 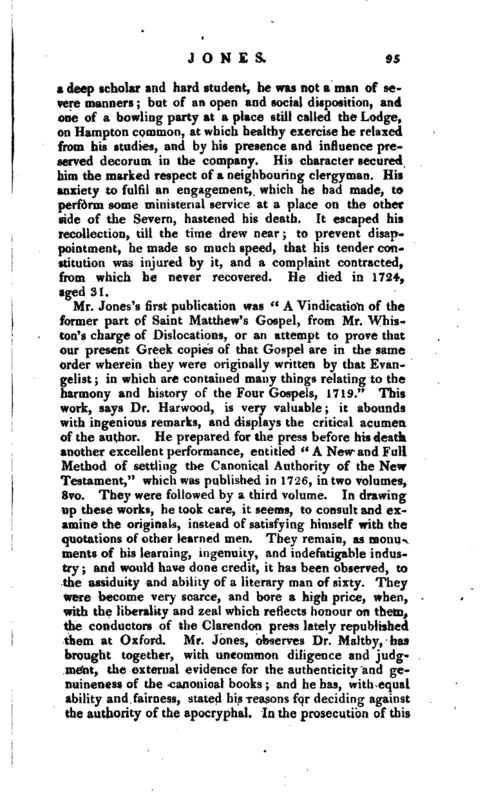 Though | a deep scholar and hard student, he was not a man of severe manners; but of an open and social disposition, and one of a bowling party at a place still called the Lodge, on Hampton common, at which healthy exercise he relaxed from his studies, and by his presence and influence preserved decorum in the company. His character secured him the marked respect of a neighbouring clergyman. His anxiety to fulfil an engagement, which he had made, to perform some ministerial service at a place on the other side of the Severn, hastened his death. It escaped his recollection, till the time drew near; to prevent disappointment, he made so much speed, that his tender constitution was injured by it, and a complaint contracted, from which he never recovered. He died in 1724, aged 31. Gent, Mag; LXXIII. p. 501.